Good news coming in for all the Nokia Lumia owners in India. Nokia India has announced the roll out of PR v1.2 for its Windows phone OS running Nokia Lumia 800 and Lumia 710 in India. The latest update goes on to bring enhanced battery life, improved audio performance and much more. 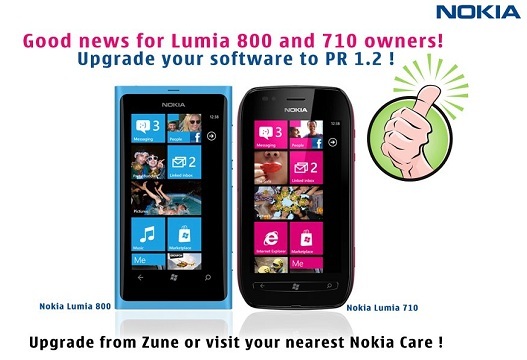 Nokia India on its official Facebook page announced that Nokia Lumia 800 and 710 owners can upgrade their devices to the latest PR v1.2 via Zune (Software Updater) or they can also visit any Nokia Care Centre and get their Lumia devices updated. Wondering what you will get the latest update? Then read on for more. So if you own a Lumia device then run your Zune updater or visit the nearest Nokia Care Centre now. © 2008-2019 - MobiGyaan. All Rights Reserved.